Preparation (prime coating) of bases before installation of welded-on, self-adhesive roofing and waterproofing materials. The prime coating is necessary for ensuring the strong adhesion of the waterproofing materials to porous, rough and dusty surfaces. The primer presents a solution of high-quality oil bitumens with a softening temperature of no lower than 80°С in specially selected organic solvents. It has an enhanced dampening ability, penetrability and short drying time. Ready for use primeris applied to the base at once, which offers additional convenience and enhanced performance. 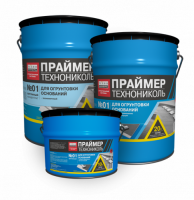 Bitumen primer #01 is recommended to be applied to a processed surface by large or small paint brushes. During application the primer is brushed into the surface, it saturates and attaches itself to it, ensuring a strong adhesion of the waterproofing covering to the base. Primer surface coverage — 0.25–0.35 l/m2 (1 l of primer per 3.33 m2).